Bill Lane (left) with father Lawrence (center) and brother Mel, 1952. Lawrence Lane's Portola Valley home designed by Cliff May, 1965. MCM interior featured on 1949 cover. Cliff May home on the cover, 1952. "The West broke the pattern of the eastern home [Sunset did not capitalize ‘eastern'] many years ago. The break was caused by people insisting on more of the values they came West to find—more sky, more sun, more flowers, more openness, more freedom. "The outdoor playroom, the barbecue shelter, the garden room, the covered terrace, the detached playroom—all these were products of the Westerner in search of Western living." Readers of Arts & Architecture were trendsetters—architects, designers, intellectuals, curators. 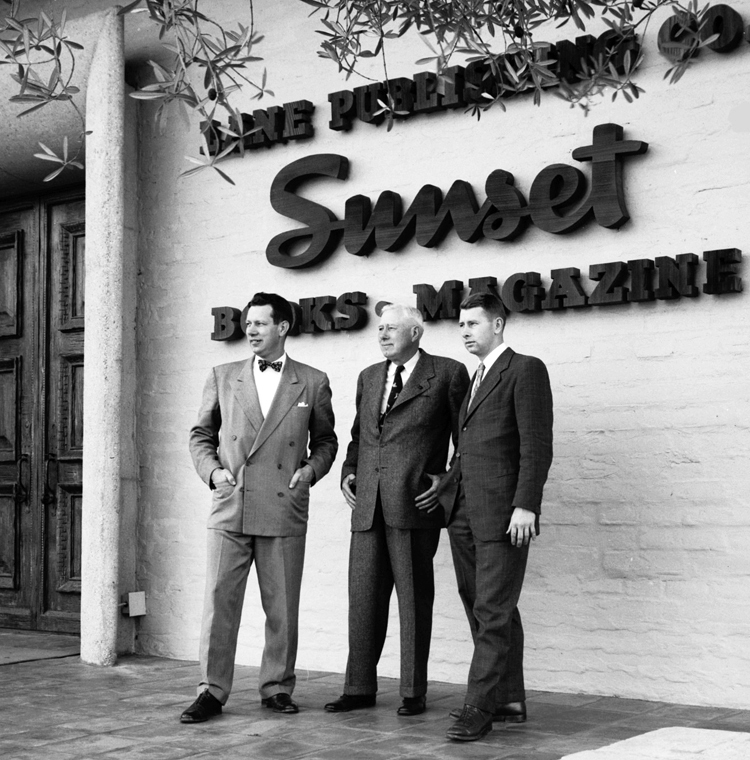 Bill Lane's sights were set instead on the common man and woman, and the goal of Sunset was to help readers solve problems. "Every article had to fulfill for a reader an accomplishment of a task," Lane said. The magazine "was a tool that was used to help these people in their lives." Sunset went to the kind of folks who might want to "whittle a figure of your dog" (April 1948), who worried about nematodes ("prevent their entrance into your garden" - March 1944), and wished to consider "the folklore of steer manure: is it really a bargain?" (June 1963). While pondering these questions, readers also got a healthy dose of—well, you might call it propaganda—that summed up all that made a modern house modern, in article after article, cover after cover, and in advertisements as well. 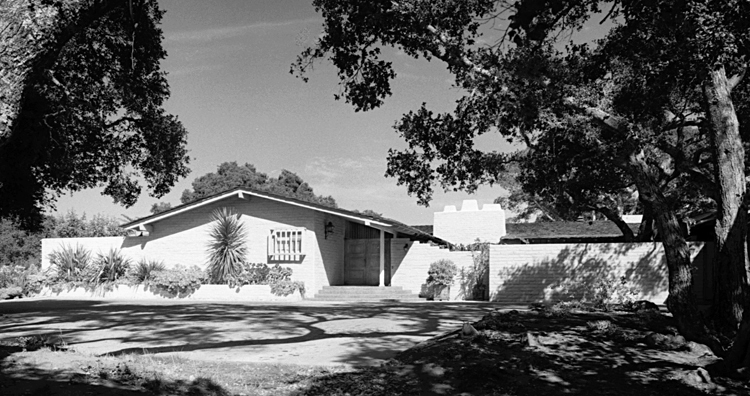 From the 1940s through early 1970s, there was hardly a house shown in the magazine that wasn't altogether modern, or at least a modern ranch. The editors who oversaw the home articles—Walter Doty in the 1940s and early 1950s, then Proctor Mellquist—were deeply committed to modernism. ‘There's a new room in the Western house...the FAMILY ROOM,' the magazine headlined in April 1956. "It's the room that the West developed—through necessity—to suit the casual Western approach to daily living." ‘The patio is the house,' a headline urged in July 1945. ‘Privacy with Glass' was another in March 1944. "You cannot consider house planning and landscaping as two [separate] operations," the magazine advised five months later. 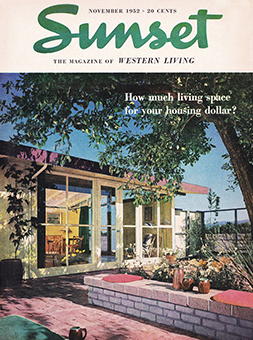 Sunset was an early proponent of ‘Decks for living,' showing a deck in September 1949 designed by Dan Saxon Palmer, later of the firm Palmer and Krisel. 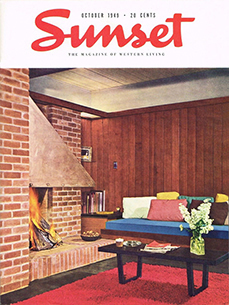 In May 1953, with a cover shot by Joe Eichler's photographer Ernie Braun, the magazine showed how people could enjoy their decks year-round by employing a fire pit, a radiant-heated slab, and a canvas overhang. Sunset's enthusiasm for outdoor living erupted again in July 1962 with ‘The trees are the walls, the sky is the roof,' a spread about the ‘home' Berkeley architect John Hans Ostwald created for his family on Lake Tahoe—five acres with outdoor dining and sleeping, a tent-like shower, and only one building—a privy. If Sunset couldn't talk their readers into living outside, they argued for the next best thing—the ‘window wall.' Braun photos in June 1955 showed living areas opening onto a Larry Halprin-designed landscape in Greenbrae, with broad paved areas for kids to play and plantings chosen for minimal care. "Once used only in a few architect-designed homes, the window wall is now commonplace," Sunset observed, then pointed out potential pitfalls—loss of privacy, glare, and excess heat.